NASA has recently released the WMAP 9 year mission results. It’s taken the WMAP team two years to analyze this latest (and last planned) round of data. On the one hand, the results are just as we expect. Each 2-year update has merely refined the findings of the previous summary. On the other hand, the WMAP mission as a whole is a huge step for cosmology. When the first WMAP image was produced in 2003, it was a huge improvement over the earlier COBE data. 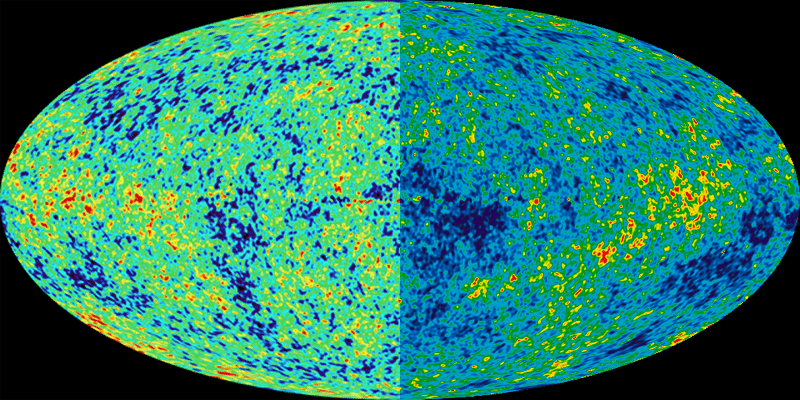 The purpose of COBE was to confirm the cosmic background as evidence of the big bang and also try to detect any variations in the background that might provide clues as to the origins of the universe. WMAP was intended as a detailed refinement of that data, to be used to “make or break” ideas like inflation and dark energy. WMAP has taken cosmology from a field of ideas to one of concrete observation. You can see how far the project has come in the image here, which compares the initial WMAP data (left) with the final 9-year data (right). 1. The universe is 13.77 billion years old (to within 0.4%). 2. The universe is “flat” (to within 0.5%). In other words, it appears to be infinite in size. 3. For the mass/energy of the universe, 4.6% is regular matter (stars, planets, and us), 24% is dark matter, and 71.4% is dark energy. 4. We know the universe is expanding, with a Hubble constant of 71 km/s/Mpc. So we now have a solid understanding of the origin and history of our universe. There are still mysteries to be solved, such as the exact nature of dark matter and dark energy, but cosmology is no longer a speculative science. We’re the first generation that can say with confidence that we understand the origin of the universe.